Copper atoms have 29 electrons and the shell structure is 2.8.18.1. 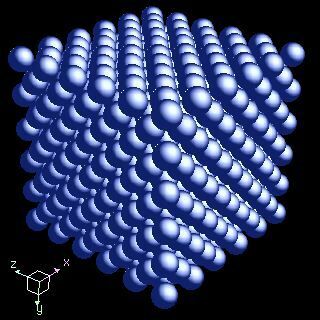 The ground state electronic configuration of neutral copper is [Ar].3d10.4s1 and the term symbol of copper is 2S1/2. Copper: description Your user agent does not support the HTML5 Audio element. Copper appears in the periodic table at the top of Group 11 above silver and gold. Collectively these are sometimes referred to as the coinage metals, although in modern times these metals are used less frequently than in the past. Copper is one of the most important metals. Copper is reddish with a bright metallic lustre. It is malleable, ductile, and a good conductor of heat and electricity (second only to silver in electrical conductivity). Its alloys, brass and bronze, are very important. Monel and gun metals also contain copper. Apparently the reason that policemen in the USA are nicknamed "cops" or "coppers" is to do with their uniforms which used to have copper buttons. Copper metal is not particularly reactive and indeed is found as the free metal ("native") on occasion. Copper sulfate is [Cu(SO4)(OH2)4].H2O in the crystalline state; it is particularly well known and was often called blue vitriol. 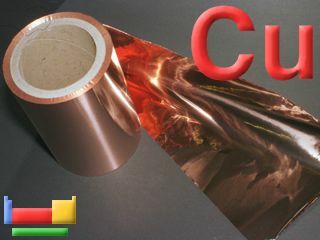 The oxidation number in most copper compounds is Cu(II), old name cupric, but there are many important Cu(I) compounds (cuprous) as well. 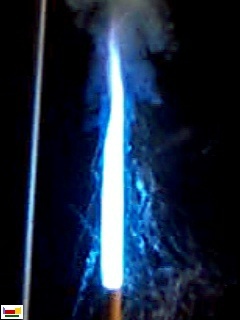 Copper (I) chloride salts imparts a blue colour to flames. The picture above shows the colour arising from adding cuprous chloride (CuCl) to a burning mixture of potassium chlorate and sucrose. This flame is relatively cool. Hotter flames burn green bacause of emission from copper atoms (only to be demonstrated by a professionally qualified chemist). The solid state structure of copper is: bcc (body-centred cubic). Copper is essential for all life, but only in small quantities. It is the key component of redox enzymes and of haemocyanin. Reactions of copper as the element with air, water, halogens, acids, and bases where known. Binary compounds with halogens (known as halides), oxygen (known as oxides), hydrogen (known as hydrides), and other compounds of copper where known. Bond strengths; lattice energies of copper halides, hydrides, oxides (where known); and reduction potentials where known. Copper was discovered by known since ancient times in unknown at not known. Origin of name: from the Latin word "cuprum" meaning the island of "Cyprus". 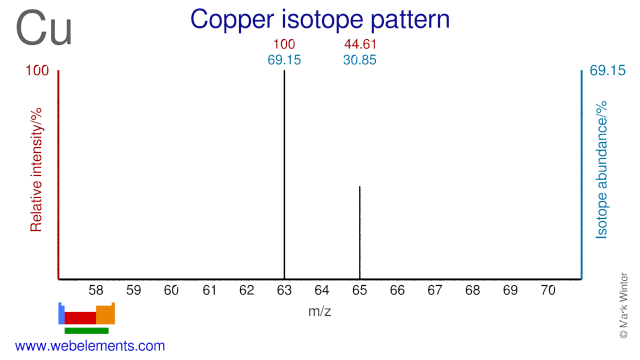 Isotope abundances of copper with the most intense signal set to 100%. Both isotopes of Copper, Cu-63 and Cu-65, are used to study copper metabolism and gastrointestinal diseases. Cu-63 is used for production of medical radioisotope Zn-62 and can also be used for the production of Cu-64 which is used in cancer diagnosis and treatment. Cu-65 has also been proposed as a precursor for the (cyclotron) production of Cu-64. Isolation: copper metal is readily available commercially so it is not normally necesary to make it in the laboratory. Most copper production is based upon sulphide ores containing little copper but quite a lot of iron. New cleaner technologies are now important but older processes present major environmental problems. Complex procedures are used initially to form a form of copper sulphide appropriate for final reduction via a copper(I) oxide. The resulting crude copper is purified using an electrolytic procedure involving plating onto pure copper cathodes. Notably, the purification step leaves an "anode slime" which contains useful amounts of silver and gold.